The Smart Tag of RadEditor lets you configure your control or quickly get help. You can display the Smart Tag by right clicking on a RadEditor control and choosing "Show Smart Tag", or clicking the small rightward-pointing arrow located in the upper right corner of the control. You can see how the Smart Tag opened in Figure 1. The Skin drop-down displays a list of available skins that you can apply to your control, along with an example of what the RadDock control looks like for each skin. Assign a skin by selecting the one you want from the list. 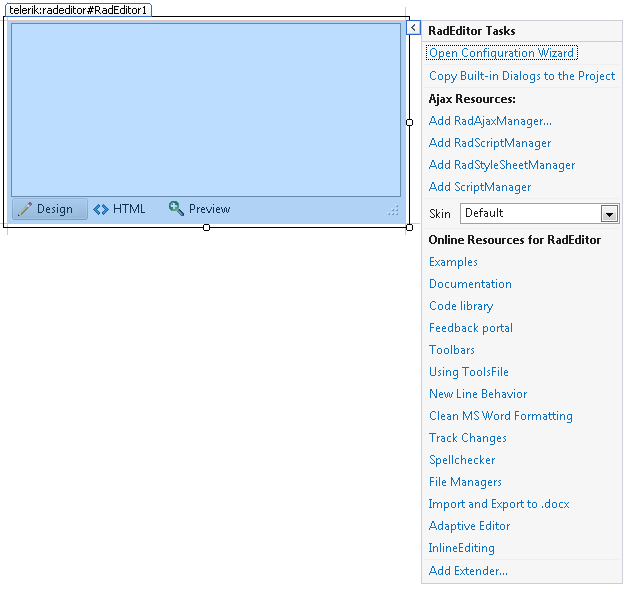 Gets the User Control files of the RadEditor built-in dialogs from the used Telerik® UI for ASP.NET AJAX suite and adds them into the project RadEditorDialogs folder.Additionally the ExternalDialogsPath property is set with the path to this folder. Note that this option will override the already existing files in the RadEditorDialogs folder. If additional dialog customizations are done, it is recommended to backup the files before this action.